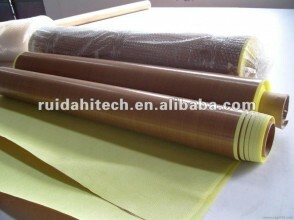 PTFE (Teflon) fabric with adhesive is PTFE fabric or PTFE film add silicone pressure sensitive adhesive which provides an excellent release surface for a diversity of industrial applications requiring high temperature, electrical resistance, mechanical strength, fire retardancy and cost effectiveness. We have two kinds of PTFE(Teflon) adhesive tape: one kind has fiberglass as its basic fabric to increase its strength, another one is pure Teflon PTFE adhesive tape. PTFE fiberglass adhesive fabric, also named Teflon fiberglass adhesive fabric, mainly used in windows frame producing, packaging, sealing industries. Pure PTFE adhesive tape, also named pure Teflon adhesive tape, features more flexible and it is insulating, it mainly used in electrical industry.